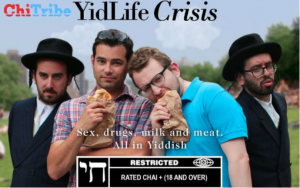 We had the chance to speak to YidLife Crisis, the dynamic duo Jamie (“Chaimie”) and Eli (“Leizer”) hailing from Montreal, Quebec, about their Yiddish webseries, which currently has over 3 million video views and 30k subscribers. Where are you from and what did you do Jewish growing up? Eli: We grew up in Montreal, where there are a minority of English speakers and a majority of French speakers. This made the Jewish community even more insular than usual. We had a traditional upbringing with Jewish day school and Jewish overnight camp, along with Israel trips. This helped to inform our perspective on the world in the first 18, or “ chai” of our lives. 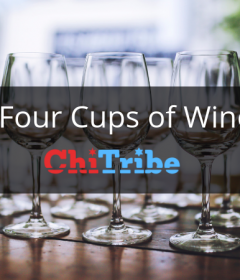 The next chai of our lives is when we broke out into media and entertainment. “YidLife Crisis” is about reconciling these different parts of our lives. Jamie: We were raised a few blocks away from each other. We were camp counselors, had our bar mitzvahs in Israel, went on March of the Living. At the end of high school, I joined the choir at a 175 year old synagogue in Montreal. I still sing in the choir when i come back to town (I live in LA). The first 18 years of my life, I virtually didn’t know any non Jews. In Montreal, between high school and university (I went to McGill), there’s a sort of ‘pre-college’ called CEGEP, which I went to downtown. We jumped from a school of 500 Jews to 8000 people from all over – Baptism by fire! Welcome to the non Jewish world! Jamie: It was incredible! I wasn’t scared. You take the metro, which lets you out underground into the building. Literally hopping on and popping up downtown and seeing the united nations and hearing different languages. I was amazed. This whole multicultural, multi-ethnic, multi-culinary world was right there. It blew my mind. Jamie: We went to the same high school in Montreal. We were 4 years apart, we actually didn’t know each other but we were both doing activities the other was interested in. I was in a band playing music, and Eli was part of a hip hop comedy duo for years. They had a successful tour and I was a big fan. How do you know Yiddish? Eli: My grandparents came from Poland and barely spoke English. I wasn’t raised in Yiddish home but my school taught Yiddish. Amongst all of our Jewish and non Jewish courses there wasn’t enough of a vigorous curriculum to be able to converse in Yiddish. Doing “Yidlife Crisis” has been like Yiddish immersion. We translate everything from English with a translator and teacher.Its applied learning. Jamie: It starts out with the Jewish “crisis” we are trying to tackle. Then we usually bring some food element in. But as for the process with language, we write in English with an eye to the Yiddish. Then we also work with a Yiddish translator and teacher, she knows a lot about the history of Yiddish, the leftist roots of Yiddish and we align with her philosophically. She is the gold standard of Yiddish. Sometimes we play, we mix in French and English or our Montreal combo of both – Frenglish. We know in advance certain words and lines and phrases that we want to use in Yiddish. Sometimes that stems from using a Yiddish word in a certain way that we know will be funny. You don’t have to be from Montreal or Jewish to like our show. We love hearing, over the years, from people who watch the episodes multiple times to get the full meaning and all the jokes. There are very few secular Yiddish speakers out there watching our show that can understand it fully without subtitles. What Yiddish words should we know? What is your favorite phrase? How did you come up with the name? Who do you aim to reach with your videos? Eli: There is no target audience. Our youtube demographics peaks in a unique way with a 25-34 age range and then peaks up again at the 65+. We have a very interesting thing which is correlated with the people that show up at our shows. Our whole shtick is about paying homage to the traditions. But as Yidlfe Crisis we are wrestling with both words. People our age resonate with it. Grandparents come with their grandchildren. Very unique audience. Do you speak any other languages? Do you speak yiddish conversationally? Jamie: Conversationally no. Elli can more so.He was the yiddish valedictorian at our highschool. Which is a rigorous process of elimination, by which i mean no one else wanted to do it. We are not fluent but we can get by. Eli: I do nothing for fun. Jamie: We are both musicians. I am a lifelong piano player. Eli is a multi instrumentalist. We bring it in to Yidlife a little bit. In Yidlife’s “Guide to the Holiday Classics”, our fake Chrismukkah holiday album, we really are playing guitar and piano. I have been playing piano once a week in Los Angeles at a place called the Varnish, just shy of ten years and it’s pry the most fun thing that I do. Jamie: 19 years ago, I moved to LA. I am an actor by trade. I have been acting professionally for more than half my life. The ‘highlight’, if I had to pick, is that I was on Curb Your Enthusiasm. I remember feeling like I was doing it for Eli and all of my friends growing up. We all worship Larry (David, the co-creator of Seinfeld and Curb). It was an amazing achievement in my personal life, never mind my professional one. Eli: On my resume, I put “friends with a guy who made a guest appearance on Curb Your Enthusiasm.” Yidlife Crisis has been a lot of what we do for the last 4 years. I have been writing some other material and I shot a feature that will come out soon. I try to do some other writing and producing but YidLife consumes most of our lives. I produced “Appiness,” currently playing in film festivals across North America. Jamie: He’s being modest or something; he directed, wrote and starred in that feature film, it’s a big deal. What’s your favorite Jewish food? Jamie: That is very very hard. Montreal is a Jewish culinary capital of the world. 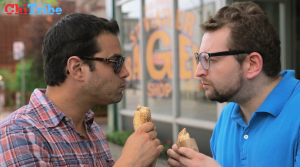 Montreal has the best bagels in the world, whatever they say elsewhere. I guess I gotta go with the classic bagel. We actually did a documentary about Jewish food in Montreal which tells the history of the Jewish community there through food. It’s on the festival circuit now too and doing well and making people drool at our smoked meats and babka. 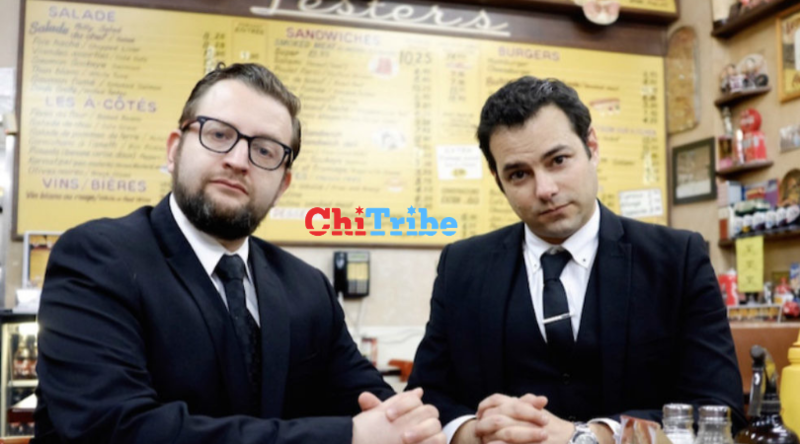 Hopefully Chicagoans will read your article and bring us over to screen it. Jamie: We brought our live show to Chicago a couple winters ago.We had a great show at some country music bar. It was an awesome venue. Grits and bbq. And it was packed. 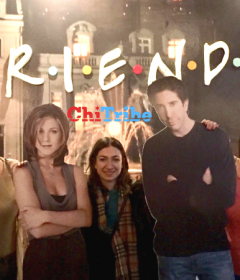 We had our videos playing on all the TVs with hundreds of young successful Chicago Jews and we are ready to come back – though, preferably, when it is warmer. Eli: Get in line for the food first. Also, check out our personal favorite: Sukkanabis, which came out right as marijuana became legalized in Canada. 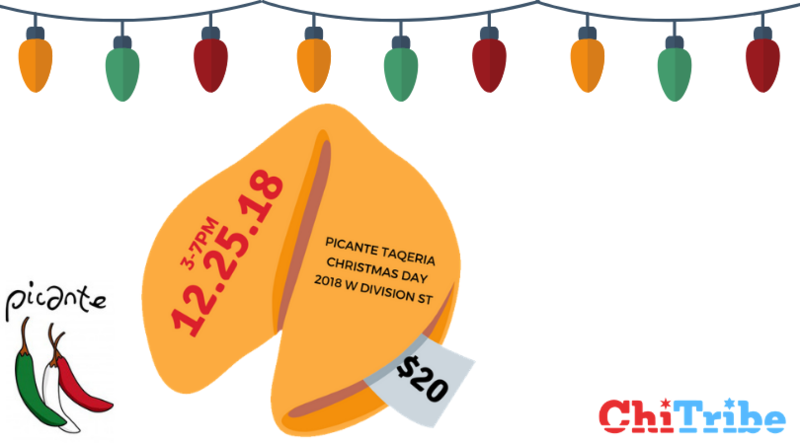 Chinese Food and Chill is happening, LIVE – this Christmas at Picante! We’ll be showing Yidlife Crisis’s Guide to the Holiday Classics and Yingl Belz, before our feature film at Chinese Food & Chill on December 25.